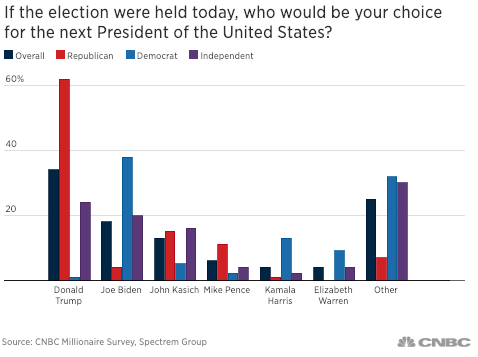 A new CNBC Millionaire Survey reveals that 34% of US millionaires, and only 62% of wealthy conservatives, would pledge support for President Trump if the election was held today. About 36% of the overall vote was spread across ten different Democratic nominees, while 22% went to other Republicans. The polling data outlines some troubling signs for President Trump, including declining support from both wealthy Democrats and Republicans. The semiannual CNBC Millionaire Survey, conducted Nov. 07 through Nov. 19 by Spectrum Group, examines the investment behaviors of 750 investors with $1 million or more of investible assets. In the survey, 40% of the 750 respondents classify as Republicans, 32% are Independents, and 26% are Democrats. 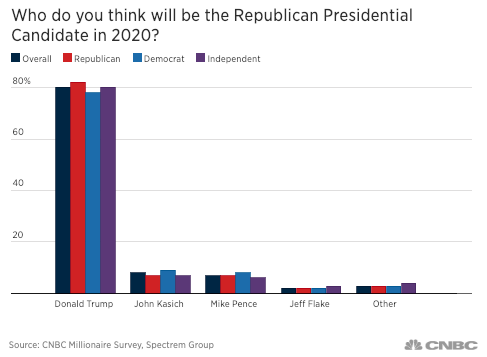 Twenty percent of respondents, including 18% of well-to-do Republicans, believe President Trump will not win the Republican nominee in 2020. About 8% think Ohio Governor John Kasich will be the nominee, while 7% believe it will be Vice President Mike Pence. This means an rising number of Republicans think President Trump will lose in 2020, or that he would likely step down from office. 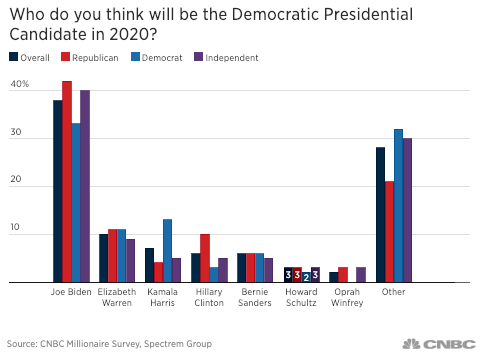 On the Democratic side, 38% of respondents believe former Vice President Joe Biden will have a decent shot at winning the party's nomination. CNBC noted that Republicans and Independents were more likely than Democrats to vote for Biden, though he is a favorite among his party. Overall, 22% responded "other," while 10% say Senator Elizabeth Warren will be the nominee. Wealthy Americans are a politically active group. Twenty percent of Republican millionaires and 36% of Democrat millionaires say they have funded local, state, or national political campaign in the last several years. "Eighty-eight percent of those who have donated to political campaigns believe the money was well spent, an indication that wealthy donors are prepared to open their wallets again in 2020," said CNBC. The data showed 18% of Republican millionaires say policies including, taxes and deficits, will be considered the most when they select the next president in 2020. That is followed by immigration reform (17%) and the economy (16%). 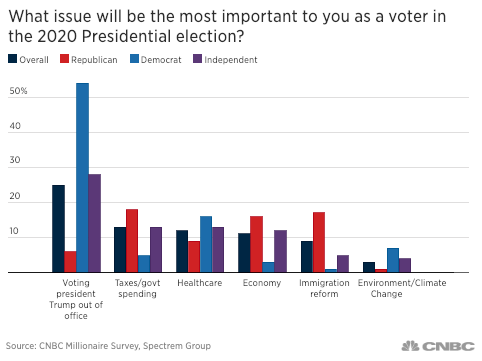 Right now, 54% of Democrat millionaires and 28% of Independents, say “voting President Trump out of office” is their number one priority. However, they do not have a suitable candidate for the job. As for the next survey expected to be completed in late spring 2019, President Trump could see a further exodus of wealthy Republicans and Democrats due to the incoming recession and crashing stock market.